In 1978 Jim Schaefer became the founding Artistic Director of the Port Stanley Summer Theatre and brought live summer theatre to the North shore of Lake Erie. 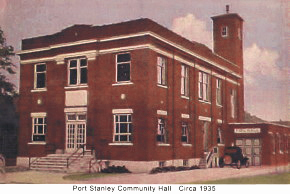 For 13 years the Port Stanley Summer Theatre provided community entertainment at the Village Hall making use of local themes, actors, and staff. In 1991 Mr. Schaefer left Port Stanley and an interested group of local citizens stepped up, elected a Board of Directors, hired Pat Spadini as Artistic Director, and mounted an “emergency season” with two touring productions. 1992 marked the beginning of what has become the Port Stanley Festival Theatre with the production of a trio of Canadian works, “Up the Creek” by local playwright Mile Mulhern, “Toronto Mississippi” by Joan Macleod, and “Salt Water Moon” by David French. Since Pat Spadini’s departure in 1998, four artistic directors, including Rick Kish, Victoria Kaeden, and Rona Waddington have contributed to the on-going growth of the Festival with a mixed program of both international and Canadian programming. During their time the Festival continued to develop new programs such as the summer Youth Camp and Community Show, increased the participation of professional artists, and purchased the Village Hall building from the municipality. Current Artistic Director Simon Joynes joined the festival in 2005, and building on the successes of his predecessors, he has worked with a strong staff team, and a succession of committed Board Members to guide the theatre through a period of unprecedented growth. In 2007 the Festival became an Equity company under the auspices of CAEA, expanded their Youth Program with foundation support, began off-season music programming, and commenced an on-going process of strategic planning. In 2010 an “all Canadian” mandate was embraced for summer programming, and the theatre committed to making the development of new work a strategic priority with the establishment of an annual Playwright’s Festival. Since 2010 the Port Stanley Theatre Festival has brought nine premiere productions to its stage. 2017 marked the opening of the final phase of an ambitious $2 million rebuilding project, five years in the planning and three years in the construction, which included a totally refurbished performance space, new shop, administration, and backstage facilities, along with a gallery, new public space, and a roof top patio overlooking the harbour. In 2019, the Port Stanley Festival Theatre is offering 6 summer productions, 4 weeks of youth programs, its 8th Annual Playwrights’ Festival, a comprehensive program of off-season entertainment, and a variety of rental options for local use. We would like to thank all those who have contributed to the journey, who have helped us grow from modest beginnings to where we are today. Thank you to staff, actors, technicians, and designers. Thank you to volunteers, Board Members, community partners, sponsors and granting bodies. But, most of all, thank you to our patrons for coming through our doors, for being there year after year, and for giving us a reason to do this thing we love.